Base class for all video devices. It is designed to provide a front end to video sources. This class should provide a virtual function that allows the acquisition of an image. Definition at line 101 of file vpFrameGrabber.h. Definition at line 120 of file vpFrameGrabber.h. Definition at line 121 of file vpFrameGrabber.h. Implemented in vp1394TwoGrabber, vpVideoReader, vpV4l2Grabber, vp1394CMUGrabber, vpFlyCaptureGrabber, vpDiskGrabber, vpPylonGrabber, vpDirectShowGrabber, vpPylonGrabberGigE, and vpPylonGrabberUsb. Implemented in vp1394TwoGrabber, vpV4l2Grabber, vpVideoReader, vp1394CMUGrabber, vpFlyCaptureGrabber, vpDiskGrabber, vpPylonGrabber, vpDirectShowGrabber, vpPylonGrabberGigE, and vpPylonGrabberUsb. Implemented in vp1394TwoGrabber, vpVideoReader, vp1394CMUGrabber, vpPylonGrabber, vpV4l2Grabber, vpFlyCaptureGrabber, vpDiskGrabber, vpPylonGrabberGigE, vpPylonGrabberUsb, and vpDirectShowGrabber. Referenced by vpVideoReader::getFrameStep(), vpDiskGrabber::getImageNumber(), vp1394CMUGrabber::getVideoColorCoding(), and vpFlyCaptureGrabber::isCaptureStarted(). 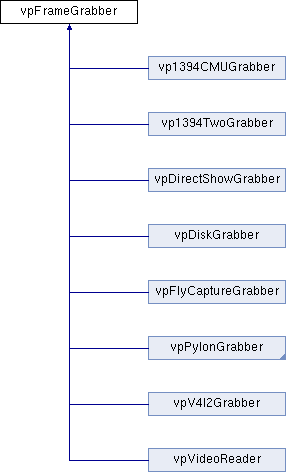 Referenced by vpV4l2Grabber::acquire(), vp1394CMUGrabber::close(), vp1394TwoGrabber::close(), vpPylonGrabberGigE::connect(), vpPylonGrabberUsb::connect(), vpFlyCaptureGrabber::connect(), vpPylonGrabberUsb::disconnect(), vpPylonGrabberGigE::disconnect(), vpFlyCaptureGrabber::disconnect(), vpDiskGrabber::open(), vpV4l2Grabber::open(), vp1394TwoGrabber::resetBus(), vp1394CMUGrabber::selectCamera(), vp1394TwoGrabber::setFormat7ROI(), vpPylonGrabberUsb::startCapture(), vpPylonGrabberGigE::startCapture(), vpFlyCaptureGrabber::startCapture(), vpPylonGrabberGigE::stopCapture(), vpPylonGrabberUsb::stopCapture(), vpFlyCaptureGrabber::stopCapture(), vp1394CMUGrabber::vp1394CMUGrabber(), vp1394TwoGrabber::vp1394TwoGrabber(), vpDiskGrabber::vpDiskGrabber(), and vpV4l2Grabber::vpV4l2Grabber().